The ultimate annual book of records is back and crammed with more than ever before! 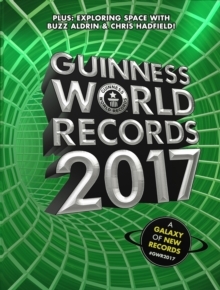 Guinness World Records 2017 is bursting with all-new records on topics as diverse as black holes, domes, owls and killer plants. Want to know the highest anyone has travelled on a skateboard, or the largest loop-the-loop completed in a car? Dying to know just how many tricks a cat can do in one minute? The answers to these questions and so much more are right inside.New in this year’s edition are exciting infographic features exploring the fascinating details on topics such as animals, the human body, sports and explorations. And of course all your favourite record categories are updated for 2017, such as the world’s new tallest dog! And as ever, our team of world-class photographers have travelled the globe to capture amazing images of the year’s most impressive record holders. Let us know your favourite! Do try this at home…Want to be a record-breaker? Inside you’ll find challenges you can try in the garden, in the kitchen, in your bedroom or even in the gym. Who knows, you may become a world record holder yourself!